A view of Florence with the Duomo in the distance. Signed and dated ‘Edward Lear. del./1839.’ (lower right) and inscribed ‘Firenze.’ (lower left). Pencil, ochre wash, heightened with white (partly oxidized) on light green paper. 9¼ x 13½ in. (23.4 x 34.2 cm.). 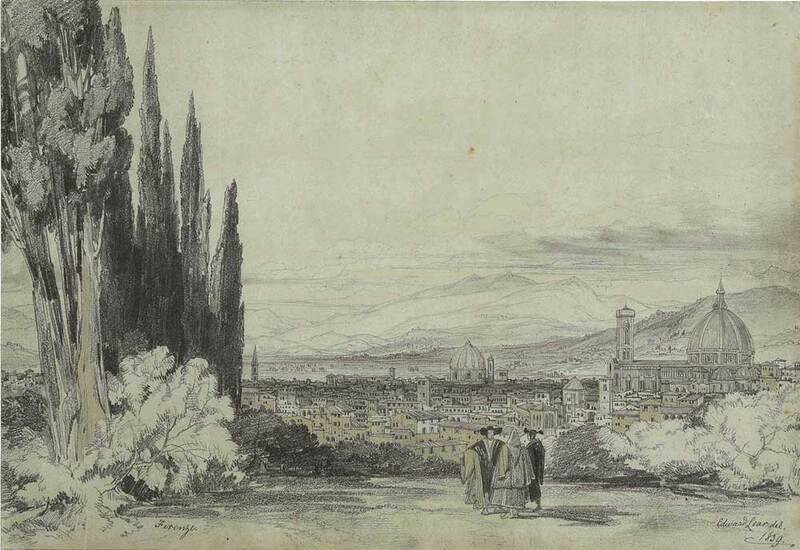 In the spring of 1839 Lear left southern Italy on a walking tour towards Florence. Even during his early travels Lear displayed a restlessness – never staying in one place for more than a few months – that would characterize his career until the last decade of his life. These early years in Italy were a period of unusual financial stability for the artist due in part to his growing number of students and from the sale of his topographical landscape drawings and the publication of two illustrated books on Italy, Views of Rome and its environs (1841), and Illustrated excursions in Italy (1846).